With how hot it is, I know I'm not really interested in running around outside. So spending my time inside, tinkering with minis seems like the best bet to beat the summer heat. 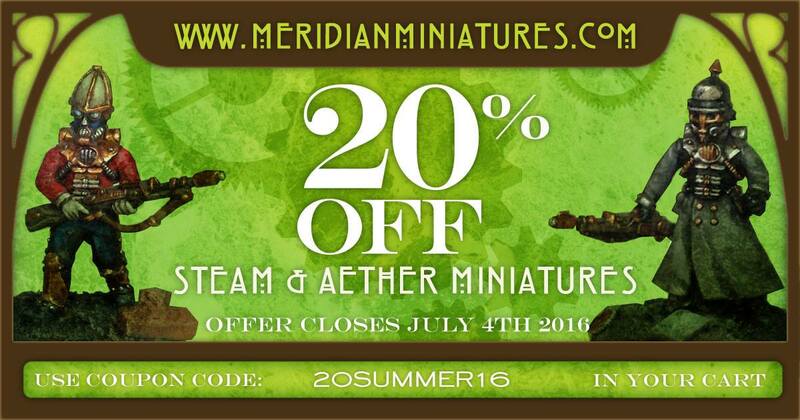 Meridian Miniatures is certainly here to help with that, too, as they've got their Summer Sale happening now. Until July 4th, you can get your order for 4/5 of the usual price. Just use the code "20SUMMER16" (minus quotes, of course) during checkout and get 20% off your order. Man, just think what the sale will be like in 9916!! Got a while to go before we get there, though, of course.